For too long now we’ve been led, often erroneously, from entry level into the realms of intermediate playing and then abandoned like a McDonalds wrapper in the car park of life. Anything else has to be begged, borrowed or stolen from resources on YouTube or from pros who suffer extreme poverty of time. So we tend to give up and our development is curtailed. For ever. Alternatively the available information is so horribly technical that a nice cup of tea with Otis, or a comfy chair and re-run of Friends is infinitely more compelling. With the entry level skills covered, Author Winslow Yerxa takes us on to all those dangerous places other harp books shy away from, or YouTube broadcasts digress from, and blows the doors right off. And all the time you are thinking to yourself YEAH BABY! What is the practical use of fourth, fifth and twelfth position? How do you make sense of modal playing? How do you get into overbending? Where’s Country and Celtic at? Have I got the balls to play in public? How about amplification? Am I qualified to undertake my own repairs? How can I slow my favourite tracks down and pick the bones out? The answers are all here. And they are provided in an accessible format which leaves you feeling enlightened, relaxed and hungry for more. Plus there is an audio CD and tab to bring everything to life. Lying in the Florida sunshine this summer, I found myself repeatedly slapping the text and hugging my wife – not the other way round. Or else thinking to myself, this is exactly what we’ve been telling students at the Harp Surgery all these years and we thought we were being radical. Save your comments. Many pages in my copy now have big pen circles and excited comments hastily scribbled in the margin for easy reference. Since then, I have had the delightful experience of meeting the author Winslow Yerxa at his Jazz Chromatic workshop in Berkeley CA. He’s as great in action as he is in print. Check out this joyous presentation by the San Francisco Scottish Fiddlers and you’ll see what I mean. Some of you may have encountered Winslow on the Harp-L forum. He is a teaching associate of Jon Gindick and Dave Barrett. He also recently worked with Howard Levy on his instructional DVDs and contributes to the amazing Harmonica Sessions newsletter. This should tell you everything. We introduce you to the man, the mind, the wit and the legend that is… Winslow Yerxa. Till then, get the book! I bought this on your recommendation and agree wholeheartedly with your review. 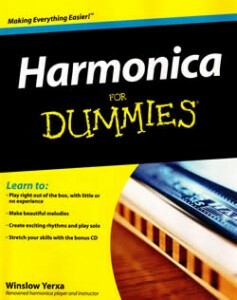 This book should be sat alongside the Harp Handbook by Steve Baker, maybe sticking out a little bit further though. It is the best book on harp that I have read and covers EVERYTHING. Playing styles, music styles, takin it apart, fixing it, tweaking it and making it and its sounds yours, it is the ultimate harmonica companion. The CD is a bonus and a welcome one, it would have been worth the wonga dosh of this player on its own, £8.99 at Amazon, bargain….but Wilf, who the heck is Winslow Yerxa? Winslow? According to Wookiepedia he is a harmonica playing Jedi Knight, directly descended from Winslow Yoda. But seriously, Winslow is a Canadian genius who resides in lovely San Francisco. He is a true gentleman and a sage of all things harmonica. If you subscribe to Harp-L you can often read his comments there, otherwise google Mel Bay’s Harmonica Sessions and get stuck in. Thanks for taking our advice about his fabulous book. There is now a Blues Harmonica For Dummies that gets a higher rating on Amazon. Have you looked at it yet? There is now a Blues Harmonica For Dummies on Amazon, which gets a higher rating. Have you read or reviewed it yet? I have a copy and it’s underneath Wilko Johnson’s autobiography and Little Walter’s biography. Should have some reading time in the coming weeks will let you know. I am confident in the meantime that anything Winslow produces will be more than worth its weight in gold. Thanks for the prompt.. most likely 2015 as things are currently so busy down at the Surgery, but keep checking!